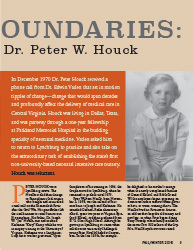 In December 1970 Dr. Peter Houck received a phone call from Dr. Edwin Vaden that set in motion ripples of change—change that would span decades and profoundly affect the delivery of medical care in Central Virginia. Houck was living in Dallas, Texas, and was partway through a one-year fellowship at Parkland Memorial Hospital in the budding specialty of neonatal medicine. Vaden asked him to return to Lynchburg to practice and also take on the extraordinary task of establishing the state’s first non-university-based neonatal intensive care nursery. Houck was reluctant. Peter Houck was a Lynchburg native. The Houcks traced their lineage to Pennsylvania coal miners who bought and resurrected a steel mill on the Shenandoah River after the Civil War. His grandfather left the steel business to retail furniture in Harrisonburg. 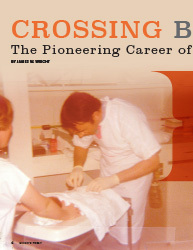 His father, Dr. Joseph W. “Joe” Houck, met and married Katherine “Kitty” Kemp while he was in surgery training at the University of Virginia. Katherine was a Langhorne; Lady Astor was her great aunt. Upon completion of his training in 1936, the couple moved to Lynchburg, where he remained in practice until 1975. James W. Wright is a graduate of E. C. Glass High School and the University of Virginia (BA and MD). He formerly practiced medicine in Lynchburg and is currently employed in the Medical Department at Genworth Financial. He and Marty have four children, one of whom, Bryan, wrote the cover story for the Spring/Summer 2008 issue of Lynch’s Ferry. 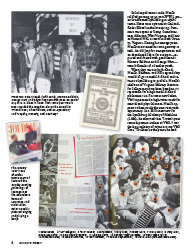 Dr. Wright’s article “Place, Pride, and Public Relations” appeared in the Fall/Winter 2013 edition.